It was a little sad to say goodbye to the “A”. After all, we started this business from scratch in 2007, and acandystore.com has been our identity since then. Over time, though, we realized the name wasn’t very clear. Our customers started calling us “THE Candy Store .com” or “ABC Candy Store .com” or just awkwardly couldn’t remember exactly what we were called. It’s not good business to have a name your customers can’t keep straight. Even our own parents kept getting it wrong. “So, son, how’s ‘TheCandyShop.com’ doing?” …Yikes. So, sad as we are to say goodbye to our lovable little “A”, we are excited about the clarity that comes with the new name. Farewell, litte A. You served us well. CandyStore.com is a great name. Short and sweet, it’s unambiguous and easy to remember. It’s also very close to our old name, candystore.com, which makes for an easy transition. But it’s one thing to say we like that name, and quite another thing to actually get it. See web addresses (“domain names”) are hard to come by these days. The domain name land grab was back in the 1990’s, and most of the good ones are already claimed. In a stroke of luck, the people who owned CandyStore.com weren’t using it for anything and offered a very reasonable price to buy it from them. It seems almost meant to be. We are so happy to have the continuity of keeping most of our original name in tact. And it rolls off the tongue a lot easier doesn’t it? The name has changed, but the people are all the same. 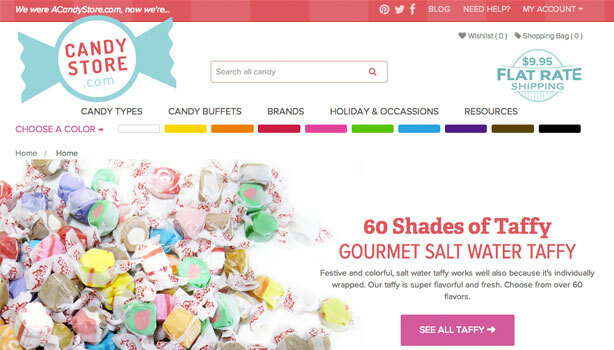 ACandyStore was not sold to another company, we just re-branded and spruced up our website a little. We are the same folks that started the business in 2007 from our garage and care about delivering the freshest candy as fast as humanly possible. All your account information is still here. If you have an account, your previous order info is here. You may have to reset your password, though. (You can do that here). Here’s a look at the old site and the new. Do you like our new name? Our new website? Let us know what you think in the comments below! I love it! The new logo and site design is great! I tried to order over $100.00 worth of candy but am told you don’t ship to California, that really sounds strange to me. If you don’t ship to California stop sending me your e-mails. It also would have been nice to find a way to contact you by phone. Oh no Aloma! Sorry to hear you were having problems. We definitely ship to California – we are headquartered in California! – so there shouldn’t be any issue. We updated our checkout this week to fix a few small bugs. Wanna try your order again? Also, here’s our phone number: 1-877-272-4563. Hi Dee! We’re trying to get them back, they went out of stock a little while back and we haven’t been able to get them. We’re working on it and should hopefully have some soon.